The mould consists of two primary components, the injection mould (A plate) and the ejector mould (B plate). These components are also referred to as moulder and mouldmaker. Plastic resin enters the mould through a sprue or gate in the injection mould; the sprue bushing is to seal tightly against the nozzle of the injection barrel of the moulding machine and to allow molten plastic to flow from the barrel into the mould, also known as the cavity. :141 The sprue bushing directs the molten plastic to the cavity images through channels that are machined into the faces of the A and B plates. These channels allow plastic to run along them, so they are referred to as runners. :142 The molten plastic flows through the runner and enters one or more specialized gates and into the cavity:15 geometry to form the desired part. To allow for removal of the moulded part from the mould, the mould features must not overhang one another in the direction that the mould opens, unless parts of the mould are designed to move from between such overhangs when the mould opens (using components called Lifters). A mould is usually designed so that the moulded part reliably remains on the ejector (B) side of the mould when it opens, and draws the runner and the sprue out of the (A) side along with the parts. The part then falls freely when ejected from the (B) side. Tunnel gates, also known as submarine or mould gates, are located below the parting line or mould surface. 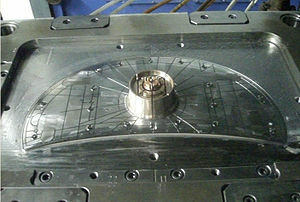 An opening is machined into the surface of the mould on the parting line. The moulded part is cut (by the mould) from the runner system on ejection from the mould. :288 Ejector pins, also known as knockout pins, are circular pins placed in either half of the mould (usually the ejector half), which push the finished moulded product, or runner system out of a mould. :143The ejection of the article using pins, sleeves, strippers, etc. may cause undesirable impressions or distortion, so care must be taken when designing the mould. To ease maintenance and venting, cavities and cores are divided into pieces, called inserts, and sub-assemblies, also called inserts, blocks, or chase blocks. By substituting interchangeable inserts, one mould may make several variations of the same part. Some moulds allow previously moulded parts to be reinserted to allow a new plastic layer to form around the first part. This is often referred to as overmoulding. This system can allow for production of one-piece tires and wheels. 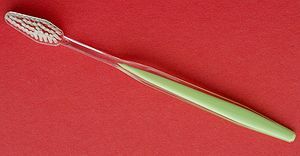 A mould can produce several copies of the same parts in a single "shot". The number of "impressions" in the mould of that part is often incorrectly referred to as cavitation. 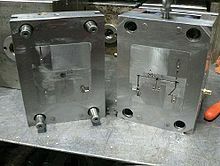 A tool with one impression will often be called a single impression (cavity) mould. :398 A mould with 2 or more cavities of the same parts will likely be referred to as multiple impression (cavity) mould. :262 Some extremely high production volume moulds (like those for bottle caps) can have over 128 cavities. Manufacturers go to great lengths to protect custom moulds due to their high average costs. The perfect temperature and humidity level is maintained to ensure the longest possible lifespan for each custom mould. Custom moulds, such as those used for rubber injection moulding, are stored in temperature and humidity controlled environments to prevent warping. Tool steel is often used. Mild steel, aluminum, nickel or epoxy are suitable only for prototype or very short production runs. Modern hard aluminum (7075 and 2024 alloys) with proper mould design, can easily make moulds capable of 100,000 or more part life with proper mould maintenance. Moulds are built through two main methods: standard machining and EDM. Standard machining, in its conventional form, has historically been the method of building injection moulds. With technological development, CNC machining became the predominant means of making more complex moulds with more accurate mould details in less time than traditional methods. The electrical discharge machining (EDM) or spark erosion process has become widely used in mould making. As well as allowing the formation of shapes that are difficult to machine, the process allows pre-hardened moulds to be shaped so that no heat treatment is required. Changes to a hardened mould by conventional drilling and milling normally require annealing to soften the mould, followed by heat treatment to harden it again. EDM is a simple process in which a shaped electrode, usually made of copper or graphite, is very slowly lowered onto the mould surface (over a period of many hours), which is immersed in paraffin oil (kerosene). A voltage applied between tool and mould causes spark erosion of the mould surface in the inverse shape of the electrode. The number of cavities incorporated into a mould will directly correlate in moulding costs. Fewer cavities require far less tooling work, so limiting the number of cavities in-turn will result in lower initial manufacturing costs to build an injection mould. As the number of cavities play a vital role in moulding costs, so does the complexity of the part's design. Complexity can be incorporated into many factors such as surface finishing, tolerance requirements, internal or external threads, fine detailing or the number of undercuts that may be incorporated. Further details such as undercuts, or any feature causing additional tooling will increase the mould cost. Surface finish of the core and cavity of molds will further influence the cost. Rubber injection moulding process produces a high yield of durable products, making it the most efficient and cost-effective method of moulding. Consistent vulcanization processes involving precise temperature control significantly reduces all waste material. With injection moulding, granular plastic is fed by a forced ram from a hopper into a heated barrel. 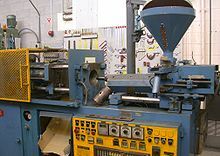 As the granules are slowly moved forward by a screw-type plunger, the plastic is forced into a heated chamber, where it is melted. As the plunger advances, the melted plastic is forced through a nozzle that rests against the mould, allowing it to enter the mould cavity through a gate and runner system. The mould remains cold so the plastic solidifies almost as soon as the mould is filled. Traditionally, the injection portion of the molding process was done at one constant pressure to fill and pack the cavity. This method, however, allowed for a large variation in dimensions from cycle-to-cycle. More commonly used now is scientific or decoupled moulding, a method pioneered by RJG Inc. In this the injection of the plastic is "decoupled" into stages to allow better control of part dimensions and more cycle-to-cycle (commonly called shot-to-shot in the industry) consistency. First the cavity is filled to approximately 98% full using velocity (speed) control. Although the pressure should be sufficient to allow for the desired speed, pressure limitations during this stage are undesirable. Once the cavity is 98% full, the machine switches from velocity control to pressure control, where the cavity is "packed out" at a constant pressure, where sufficient velocity to reach desired pressures is required. This allows part dimensions to be controlled to within thousandths of an inch or better. When filling a new or unfamiliar mould for the first time, where shot size for that mould is unknown, a technician/tool setter may perform a trial run before a full production run. He starts with a small shot weight and fills gradually until the mould is 95 to 99% full. Once this is achieved, a small amount of holding pressure will be applied and holding time increased until gate freeze off (solidification time) has occurred. Gate freeze off time can be determined by increasing the hold time, and then weighing the part. When the weight of the part does not change, it is then known that the gate has frozen and no more material is injected into the part. Gate solidification time is important, as it determines cycle time and the quality and consistency of the product, which itself is an important issue in the economics of the production process. Holding pressure is increased until the parts are free of sinks and part weight has been achieved. Color streaks (US) Colour streaks (UK) Localized change of color/colour Masterbatch isn't mixing properly, or the material has run out and it's starting to come through as natural only. Previous colored material "dragging" in nozzle or check valve. Flash Burrs Excess material in thin layer exceeding normal part geometry Mould is over packed or parting line on the tool is damaged, too much injection speed/material injected, clamping force too low. Can also be caused by dirt and contaminants around tooling surfaces. Gate Blush Halo or Blush Marks Circular pattern around gate, normally only an issue on hot runner molds Injection speed is too fast, gate/sprue/runner size is too small, or the melt/mold temp is too low. Jetting Part deformed by turbulent flow of material. Poor tool design, gate position or runner. Injection speed set too high. Poor design of gates which cause too little die swell and result jetting. Knit lines Weld lines Small lines on the backside of core pins or windows in parts that look like just lines. Caused by the melt-front flowing around an object standing proud in a plastic part as well as at the end of fill where the melt-front comes together again. Can be minimized or eliminated with a mould-flow study when the mould is in design phase. Once the mould is made and the gate is placed, one can minimize this flaw only by changing the melt and the mould temperature. Polymer degradation Polymer breakdown from hydrolysis, oxidation etc. Excess water in the granules, excessive temperatures in barrel, excessive screw speeds causing high shear heat, material being allowed to sit in the barrel for too long, too much regrind being used. Sink marks [sinks] Localized depression (In thicker zones) Holding time/pressure too low, cooling time too short, with sprueless hot runners this can also be caused by the gate temperature being set too high. Excessive material or walls too thick. Splay marks Splash mark or silver streaks Usually appears as silver streaks along the flow pattern, however depending on the type and color of material it may represent as small bubbles caused by trapped moisture. Moisture in the material, usually when hygroscopic resins are dried improperly. Trapping of gas in "rib" areas due to excessive injection velocity in these areas. Material too hot, or is being sheared too much. Stringiness Stringing or long-gate String like remnant from previous shot transfer in new shot Nozzle temperature too high. Gate hasn't frozen off, no decompression of the screw, no sprue break, poor placement of the heater bands inside the tool. Voids Empty space within part (air pocket is commonly used) Lack of holding pressure (holding pressure is used to pack out the part during the holding time). Filling too fast, not allowing the edges of the part to set up. Also mould may be out of registration (when the two halves don't center properly and part walls are not the same thickness). The provided information is the common understanding, Correction: The Lack of pack (not holding) pressure (pack pressure is used to pack out even though is the part during the holding time). Filling too fast does not cause this condition, as a void is a sink that did not have a place to happen. 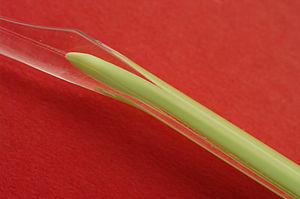 In other words, as the part shrinks the resin separated from itself as there was not sufficient resin in the cavity. The void could happen at any area or the part is not limited by the thickness but by the resin flow and thermal conductivity, but it is more likely to happen at thicker areas like ribs or bosses. Additional root causes for voids are un-melt on the melt pool. Weld line Knit line / Meld line / Transfer line Discolored line where two flow fronts meet Mould or material temperatures set too low (the material is cold when they meet, so they don't bond). Time for transition between injection and transfer (to packing and holding) is too early. Methods such as industrial CT scanning can help with finding these defects externally as well as internally. Moulding tolerance is a specified allowance on the deviation in parameters such as dimensions, weights, shapes, or angles, etc. To maximize control in setting tolerances there is usually a minimum and maximum limit on thickness, based on the process used. :439 Injection moulding typically is capable of tolerances equivalent to an IT Grade of about 9–14. The possible tolerance of a thermoplastic or a thermoset is ±0.200 to ±0.500 millimeters. In specialised applications tolerances as low as ±5 µm on both diameters and linear features are achieved in mass production. Surface finishes of 0.0500 to 0.1000 µm or better can be obtained. Rough or pebbled surfaces are also possible. The power required for this process of injection moulding depends on many things and varies between materials used. Manufacturing Processes Reference Guide states that the power requirements depend on "a material's specific gravity, melting point, thermal conductivity, part size, and molding rate." Below is a table from page 243 of the same reference as previously mentioned that best illustrates the characteristics relevant to the power required for the most commonly used materials. Automation means that the smaller size of parts permits a mobile inspection system to examine multiple parts more quickly. In addition to mounting inspection systems on automatic devices, multiple-axis robots can remove parts from the mould and position them for further processes. Specific instances include removing of parts from the mould immediately after the parts are created, as well as applying machine vision systems. A robot grips the part after the ejector pins have been extended to free the part from the mould. It then moves them into either a holding location or directly onto an inspection system. The choice depends upon the type of product, as well as the general layout of the manufacturing equipment. Vision systems mounted on robots have greatly enhanced quality control for insert moulded parts. A mobile robot can more precisely determine the placement accuracy of the metal component, and inspect faster than a human can.